Balanov was amongst the richest man in western Moscow.He was rich enough to satisfy all his needs and his wants and all that his heart desired.He was a stakeholder in Moscow telecoms.His wife and his two daughters were proud of him.He started working since he was 15 years old owing to poverty.He was the only son to his parents.Since, he started working from a very young age,he was deprived of basic education.During those days to freed himself from family tensions ,he started drinking liquor.Now,he is 45 and is addicted to alcohol.Although he was rich, he had his own personal problems. The economic crisis had badly affected the European markets as well.As a result of this Lehman bro, Merylynch, ING Vysya had suffered great losses.Moscow Telecom was on the verge of a collaspe.He lost all his wealth in the event of regaining his company.The company was shut down.He could feel the pressure and his alcohol consumption increased.He started hating his wife and children.Few days later ,the Russian bank seized his house and froze his accounts.He was forced to live in streets.Now ,the king became a pauper in less than one days time.Now, he never cared for everyone.He purchased bottles of Whisky,Vodka and Rum everyday and drank it at once. Few days later he had no money left with him.He forced his wife and children to work and get him liquor everyday.The Economic crisis had badly affected him.He went to depression.Now all that he wanted was alcohol.He wanted Whisky and Rum."Whiskyyyyyyyyyyyy!! !," he screeched . The wife and his children were helpless and could not see their loved one in pain. His eyes grabbed attention of a perfume bottle that was lying on the table.He checked for the contents and soon spotted 68% Alcohol written on the perfume cap.He removed the lid and consumed entire bottle. He was addicted to such an extent that he failed to understand difference between alcohol and alcohol in perfume with different contents.Few minutes later he could feel the effects.He could feel the burning sensation of his lungs.He was already suffering from Liver Cirrhosis due to excessive consumption of alcohol.He slept for a while and within no time he gave his life. Alcohol consumption means consumption of liqour in the form of Vodka,Rum,Whisky,Brandy etc.Alcohol addiction is a type of addiction that will not only affect you by creating various disorders,but also affects your family.Alcohol is not the only solution to it. Balonov coudn't resist and hence he consumed the perfume bottle. Pour in your views?? I am waiting to hear it from you. This is pathetic and sad at the same time!!! whatever u said made so much sense... God! it's such a poisen isn't it??? All said and done, I join the cause. Nice post Ste. Liked the way you put across the message. I'm glad that someone has finally come up with a post on an issue that should have been all over the web by now...Its really strange that people, specially youngsters associate alcohol as a symbol of class and style..Some do it because they want to be seen as a part of the cool brigade..some do it as an excuse to expressing their emotions...at the end of the day all they are doing is harming themselves..
Good message ste. Its shocking to know that people ruin their lives and of others too because of alcohol.. You rightly said that once a person is addicted.. It hampers his brain n mind so much so that he cannot differentiate from right n wrong.. He falls to it.. 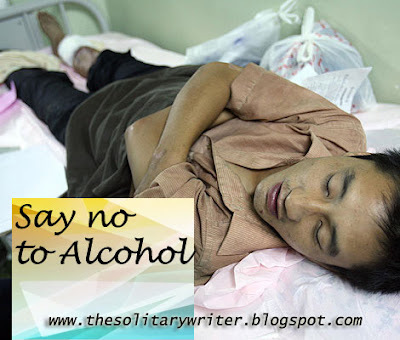 I join you in your post against alcohol.. Say no to alcohol.. There are those who say "Well, I'll just try it this once. Just for the heck of it!" And the once, becomes n number of times, and in no time at all addiction could set in. However in the lifes and times of a contemporary human, drinking socially is accepted. Whatever this gives the impression of, it becomes the beginning of a later addiction, more often than not. So it is always better to be aware and beware. Saying "no" flatly is the way to Life. I would second that. If you are reading this , i suggest you read this story instead and think !!! !